Darfon’s H5001 hybrid transformerless inverter is integrated with a distribution box to facilitate easy installation. 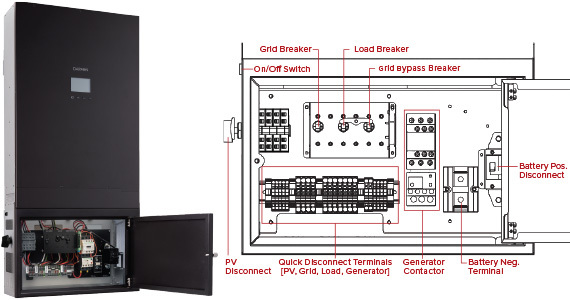 The distribution box includes quick disconnect terminals, PV and battery disconnects, AC breakers, battery connectors and generator contactor. The H5001 supports a wide range of applications, including off-grid, self-use, net-metering, backup, time-of-use optimization and as a string inverter.